This column was written by Tom Rose. The past week has been a good one for terrorists. The birth of the world's first truly terrorist state in Gaza was quickly followed by a Western response that, if sustained, all but guarantees that terror state's survival. While there are plenty of examples, past and present, of states that encourage, fund and even practice terrorism, no nations have ever been created explicitly for the sake of terrorism. Not even the Taliban. Hamas was built upon the terrorist edifice created by the organization it recently supplanted — the Palestine Liberation Organization (PLO), or "Fatah" as it is has become more recently known. The PLO was created in 1964, three years before the Israeli occupation of the West Bank and Gaza, not to create the world's 22nd Arab state, but to destroy its only Jewish state. Hamas overthrew the PLO in Gaza not to change the PLO's dream, but to fulfill it. What, then, is Washington's answer to Hamastan in Gaza? Why, another bailout of the one organization responsible for the entire debacle in the first place — the PLO. After 45 years of ground work preparing for Hamas' takeover by radicalizing Palestinian society through blood-curdling terrorism, mind-boggling corruption, and world-class inefficiency, the U.S. and Israeli governments have announced their gratitude to Fatah with a billion dollar emergency aid package. Worse than being just another advertisement for diplomatic incompetence, this feeble response to the Hamas takeover will achieve the opposite of what we claim to want. Force-feeding life back into the PLO will not weaken Hamas; it will strengthen it by giving the PLO another chance to demonstrate its fraudulent duplicity. Funding the PLO will not strengthen any real Palestinian moderates; it will discredit them by seeming to tie their fortunes once again to a corrupt, inept — and immoderate — organization. Palestinian society cannot be transformed by reviving the group responsible for its degradation. How does one fight terrorism by rewarding those who invented it? Do "Fatah first" advocates believe that financially rewarding the already heavily-armed and well-funded "security" fighters of Fatah, who turned tail and ran at the sight of Hamas gunmen, will lead them now to fight to retake their posts, having gotten a check from Washington? Do they think the PLO's corruption is best combated by re-upping the employment contracts for its 200,000 dysfunctional bureaucrats — 60,000 of whom are the gangsters, thugs, and terrorists associated with the PLO's 13 so called "security services"? With Israeli Prime Minister Ehud Olmert dutifully nodding by his side, President Bush called last week's debacle "a wonderful opportunity for freedom." How exactly is the resurrection of the world's founding terrorist organization a "wonderful opportunity" for anything other than more terrorism and corruption? It might be one thing if a policy of saving the PLO had never been tried. But it has been tried, and it has failed, not once, not twice, but three times. It was tried and failed in 1970 when President Nixon pressured Jordan's King Hussein to let the PLO decamp to Lebanon after the PLO failed to destroy Jordan. It destroyed Lebanon instead. In 1982 the United States again came to the PLO's rescue by arranging its exit from Lebanon during the Israeli invasion. The third, most damaging resuscitation came with the Oslo Peace Accords in 1993, this time not at American hands, but at Israel's. President Bush's "wonderful opportunity" pabulum is not only an embarrassing absurdity; it misses the whole point of what has happened in Gaza. Now there are two Palestines, an East Palestine (the West Bank) controlled by competing and discredited PLO warlords, and a West Palestine (Gaza) ruled by a fervently jihadist, well-organized, and highly disciplined Hamas. Even if something could be done to support Fatah in the West Bank (which in itself is undesirable), this would not enable Fatah to return to Gaza. The PLO is finished. The Palestinians know it. The Arabs know it. Only we don't know it. The PLO's leader, Abu Mazen, is as likely to use the West Bank to retake Gaza as Chiang Kai-shek was to use Taiwan to retake Communist China. Today's lifeline to the PLO will do no more to reverse the Hamas takeover of Gaza than American support for Chiang in the 1950s did to reverse Mao's takeover of the Chinese mainland. But at least with Taiwan we eventually got a model prosperous democracy — far more than we will ever get from supporting Fatah. Even in the West Bank, where the PLO is supposedly strong, Fatah is more a fiction than a fact. Its leader, Abu Mazen, is Palestine's version of the Holographic Doctor from Star Trek Voyager. As far as most Palestinians are concerned, he is nothing but a figment of the West's imagination, and not a very imaginative one at that. The 13 private militias and armies that make up Fatah control Abu Mazen. He does not control them. 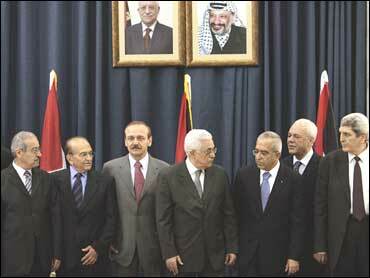 Abu Mazen is a puppet with no strings. He has no following in either Palestine, East or West. And the Bush-Olmert plan to prop him up won't succeed for long. The immediate danger to Israel and the West comes from Gaza, not the West Bank. It is in Gaza that Hamas can assemble serious and dangerous weaponry with which to attack Israel (not to mention other Palestinians). It is in Gaza, not the West Bank, where agents of the Iranian regime will plant themselves for renewed war against Israel. It is in Gaza where al Qaeda and other terrorists are already establishing themselves. Gaza is a terror threat, and the West Bank could well become even more of one than it is now. This is the reality democratic leaders should face, rather than wishing what is happening were not.